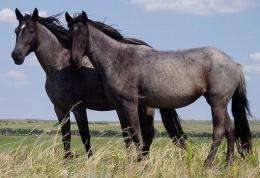 Two young Nokota mares. Image: Wikipedia. Injecting DNA into injured horse tendons and ligaments can cure lameness, new research involving scientists at Kazan Federal University, Moscow State Academy and The University of Nottingham has found. The gene therapy technology was used in horses that had gone lame due to injury and within two to three weeks the horses were able to walk and trot. Within just two months they were back to full health, galloping and competing. The study has big implications not just for the veterinary world but the future of human medicine - injuries like these are common in people as well as animals, not just in lameness but in other illnesses and diseases from the legs and arms through to the back and hips. The new findings are the result of a partnership between the Kazan Federal University and Moscow State Academy of Veterinary Medicine and Biotechnology and Nottingham's School of Veterinary Medicine and Science. Dr Catrin Rutland, Assistant Professor of Anatomy and Developmental Genetics, led the work at Nottingham. She said: "This pioneering study advances not only equine medicine but has real implications for how other species and humans are treated for lameness and other disorders in the future. The horses returned to full health after their injuries and did not have any adverse side effects. This is a very exciting medical innovation." The ground-breaking, international study, published in the academic journal Frontiers in Veterinary Science, demonstrated gene therapy using a combination of the Vascular Endothelial Growth Factor gene VEGF164, to enhance the growth of blood vessels and bone morphogenetic protein 2 (BMP2), which plays an important role in the development of bone and cartilage. Both the genes were derived from horses, resulting in the biosynthesis of natural horse proteins in the treated animals. They were cloned into a single plasmid DNA, which is both biologically safe and unlikely to provoke an immune reaction from the body. Current medical therapies have a relapse rate of 60 per cent and even the best regenerative medicine treatments have a 20 per cent relapse rate and take five to six months to work. The new therapy is therefore very promising as it offers a much faster healing time and could significantly reduce relapse rates. The results also showed that the tissue within the horses limbs has also fully recovered and 12 months after the revolutionary treatment the horses were completely fit, active and pain free. Many medicines and treatments have adverse effects, but no side effects or bad reactions were seen in the horses treated. Professor Albert Rizvanov, who led the study and is based at Kazan Federal University, said: "Advancing medicine, relieving pain and restoring function were the main aims of this study. We have shown that these are possible and within a much shorter time span than treatments available at the moment. In addition, we could use this type of therapy in other injuries and in many other situations ranging from fertility problems through to spinal cord injuries. "Our next step is to secure more funding for an even larger trial to help more animals and improve and treat other disorders in the hope that one day we can routinely use this treatment around the world."